A THOUSAND SUNSETS is a tale of second chances. Given, taken, and thrown away. Struggling to be a dad and a son, Alexander didn’t know he was lost. Living her dream, Sarah didn’t know she needed to be found. Enter cupid in the form of a dying man, who hasn’t had much contact with his children and grandchildren in the years after his wife’s death. In the meantime, however, a new family has formed around him. Patrick McCullough’s staring contest with death and wish to unite the family of his blood and the one of his heart kindles love meant to last, causes tempers to flare, and creates second chances that are given, taken, and thrown away. In the middle of the chaos, a young boy struggles to stay afloat. I plotted out much of A THOUSAND SUNSETS in a parking lot in October of 2011. The rain was drumming against the window, and I was waiting to drive my dad home from a meeting. The plot and the characters flowed into my head so fast that I could barely keep up as I wrote it down. A few days later, October became November, and I dived into the wonderfulness of NaNoWriMo, armed with the notebook I’d filled in that rainy parking lot. 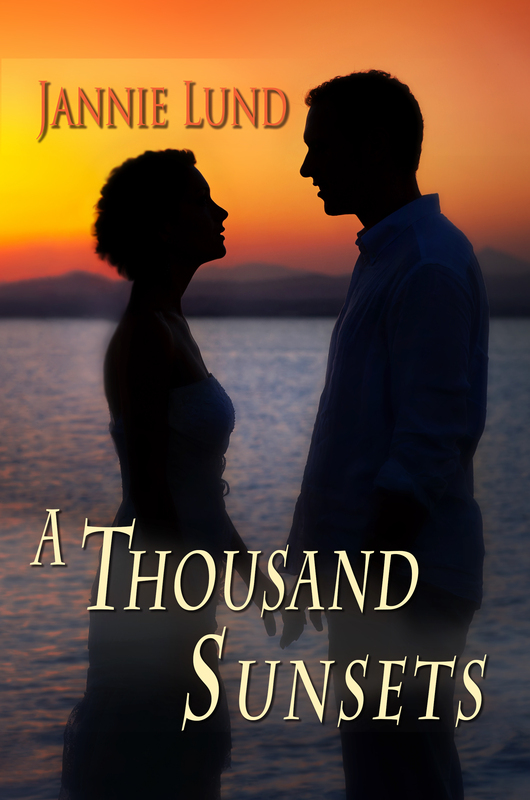 A month later, I had a very rough version of A THOUSAND SUNSETS, which I then polished, put in a drawer, and only took out once in a while to brew over. And then I finally submitted it. It’s out now. Published by Satin Romance, an imprint of Melange Books. It’s available digitally and in print, and you can find it on the Satin Romance website, on Amazon, lulu.com, and probably in all the usual places book lovers go for their fixes. You can also find it on Goodreads, and you can find yours truly on Twitter and Facebook. This entry was posted in A Thousand Sunsets, New Release and tagged A Thousand Sunsets. Bookmark the permalink. Our little Jay is all grown up! So very proud of you. I’m behind on my reading but I will catch up and will post reviews all over the place. I’d still like an autographed first edition please 🙂 not every day someone I know and love publishes a novel, and not on the internet either! Yes, and about time I grew up too, huh? 😉 I’ll see what I can do about that autographed first edition. Mwah! Looking for the next book to read? Why not try this fresh-off-the-press novel from my dear friend, Jannie Lund.